A scene can contain one or more encounters, or none at all. What's important is that the scene serves some purpose in the story, be it to introduce the players to the villain, create a bonding moment for the PCs, advance the plot, and so on. While random encounters are great in dungeon crawls, anything that doesn't serve a greater purpose in the story is just filler. Don't add encounters just to meet an XP quota - give those encounters purpose, even if that purpose is solely to establish the setting as one that is dangerous. And if that's the case, ensure you use other elements to support that purpose - evocative descriptions, setting an appropriate tone, and focusing on the elements of danger above all else. Shadows of Esteren made me realize that, for years, I'd been trying to structure my adventures in scenes, but when putting pencil to paper, would follow the sequential encounter structure typical of a D&D module. The scenes were all there - but they were in my head, rather than neatly organized in my notes. The result was suboptimal organization and added mental strain while running sessions. Let's draw excerpts from the first scene in a Shadows of Esteren adventure, which could have easily been written as a standard D&D encounter. The write up opens with a suggestion to play a specific track from the Braveheart soundtrack to set the mood and some advice on keeping details scant for the time-being in order to engage the players rather than "infodump" on them. "The aim of this scene is to throw the players directly into the heart of the story," the description reads. It goes on to establish the opening situation - the PCs are spending the night in a little mountain chapel when suddenly, they hear unsettling noises. "Strange snorting, the chapel door moving, claws scratching... it would seem that monstrous creatures are about to attack!" The write-up instructs the DM on how he can keep pressure on the players in order to maintain a tense atmosphere, and when he "decides that the tension is at its peak, the beast will eventually attack." A stat block for the creature - a mutated bear - follows, as well as information on what can be learned from examining it (or its corpse), which are precursors to the main plot of the story. In short, in D&D, story is the stuff that happens between fights. Or, to put it more adroitly, story is the vehicle that drives the characters to encounters. In Shadows of Esteren, encounters are a consequence of experiencing a story. 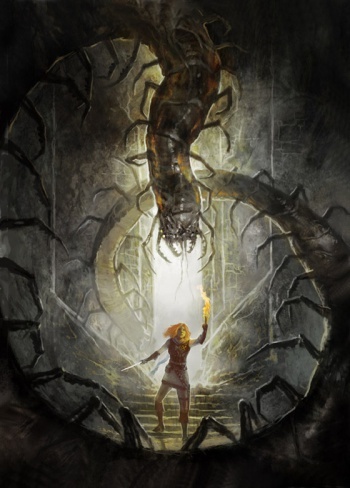 Know the type of game you want to run - if it's a good ol' fashioned dungeon crawl, stick with an encounter-based structure. But if you want a more story-driven experience, start thinking in scenes.